The 'Free Tony Taylor' billboard on the Northland Road, which has been vandalised for the second time. 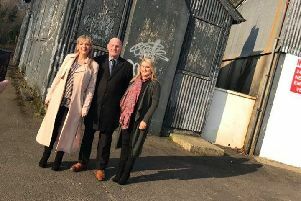 Vandals who partly demolished a billboard urging the immediate release of Derry republican Tony Taylor will not deter those campaigning for his release, according to one local councillor. Independent councillor, Gary Donnelly, said it was the second time the poster on the Northland Road has been attacked by vandals. Mr. Taylor has been in prison for over two years now following the revocation of his early release licence by the former Secretary of State for the North, Theresa Villiers, who took the decision based on a security service risk assessment that critics say has not been tested in the courts. Colr. Donnelly said: "The Tony Taylor board in the Northland road has been vandalised. The previous board had also been destroyed and had been replaced. If those behind this vandalism think the will silence those highlighting the injustice that Tony and his family are enduring they are seriously mistaken." The Independent councillor went on to quote Terence MacSwiney's, "it's not those who can inflict the most but those who can endure the most who will conquer", in insisting that the 'Free Tony Taylor' campaign will continue. Sinn Féin justice spokesperson Raymond McCartney MLA, meanwhile, has reiterated his party's call for the immediate release of Mr. Taylor following a rally at Free Derry Corner. The Foyle MLA said: “Tony Taylor has now spent over 840 days in Maghaberry Prison, without having been charged, questioned or allowed legal representation. “Sinn Féin has consistently stated that if evidence exists to show that Tony Taylor is a risk to the public it should be put before him and his legal team in open court so this can be challenged. “His unjust detention in this way fuels the perception of a form of legalised interment by remand. It is a violation of fundamental human rights and subversion of due process.